Narragansett’s Coast Guard Towers are a welcome sight to vacationers arriving in this coastal beach town. 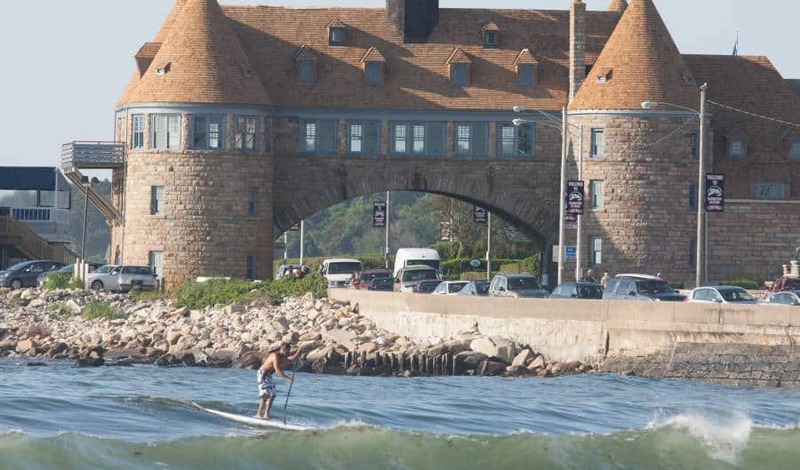 The historic stone building spans the waterfront Ocean Road and reminds visitors of Narragansett’s history as a summertime destination for wealthy New Englanders. Narragansett and other coastal New England towns were popular with wealthy urbanites who sought to exchange the crush and heat of the cities for some fresh country summer air. By the end of the nineteenth century, Narragansett even rivaled Newport as a prestigious place to summer. The iconic stone waterfront towers, part of the Narragansett Pier Casino, surely contributed to this reputation. The resort was built between 1883 and 1886 and catered to summer clientele that spent the whole season at the beach. The resort offered activities like sports (including bowling! ), boating, shopping, theater, dining, and of course, a grand ballroom. The heyday of the Pier Casino continued until the resort burnt down in 1900. The towers survived the fire and were rebuilt — and have since withstood several fires and hurricanes, making them a local good luck charm. Today, Narragansett’s Coast Guard Towers are home to a restaurant and an event center, continuing the building’s tradition of entertaining vacationers. Ballroom dancing lessons take place every Wednesday night, and November brings a Masquerade Gala and a Rock and Roll Dance night. But whether you’re stopping in with your dancing shoes in hand or for a drink at the bar of the Coast Guard House restaurant, the towers are worth a tour during your stay at the beach.